Choosing to include hardwood flooring in your home can be a valuable investment. Hardwood flooring will make a huge impact on the look and feel of your home spaces. It can also make your cleaning tasks easier, and can be an imporant selling point if you decide to sell your home down the road. 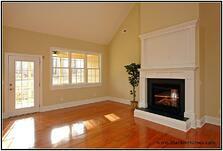 There are many types of hardwood flooring available for your Raleigh new home. 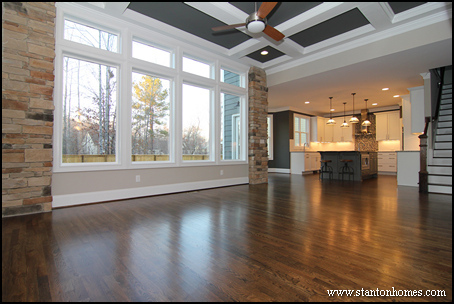 While some North Carolina home buyers prefer engineered or pre-finished hardwood flooring, the most common selection in a Stanton Home is site-finished 3/4'' solid hardwood floors. When choosing a style of hardwood for your floors, you will want to consider a few key features: type of wood, color, finish, texture, and plank width. 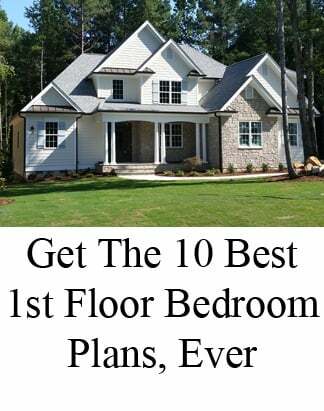 Read about how to choose a type of hardwood flooring, and see photos of Raleigh new homes with light, medium, and dark hardwood floors. These photos will help you compare and contrast hardwood flooring styles and colors. Each wood speices has a distinct grain pattern and relative hardness. 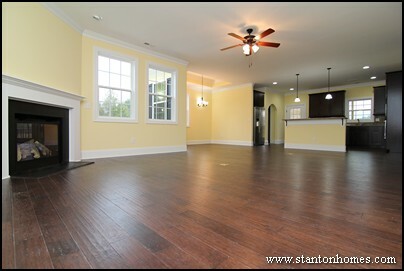 Oak is one of the most popular types of hardwood flooring for Raleigh new homes. 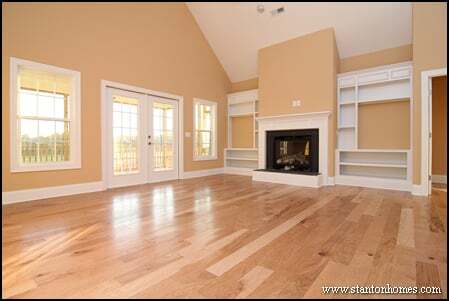 Home buyers also frequently request maple, cherry, bamboo, and cork flooring. What is the best flooring for dogs? Learn how to choose the right hardwood flooring for pets. Other types of hardwood flooring include American Cherry, American Walnut, and Pine. These woods are very soft and will dent quite easily, even if there are no pets or children in the home. 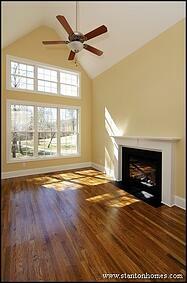 They also usually cost more, as there is a much smaller demand for these types of flooring and the wood is more rare. 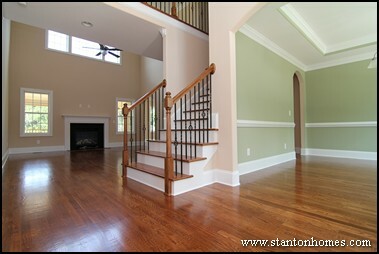 The color of stain you choose depends in part on the type of wood you like best - the two should compliment one another. Keep in mind that some wood species soak up the stain color more easily than others. Design Tip: Consider testing a stain color on a sample piece of wood. That will give you a good idea of the finished product, before applying the stain to your floors. Because hardwood is a natural material, no two pieces will look the same - and your stain color will accentuate (or hide) those natural variations in texture and grain. 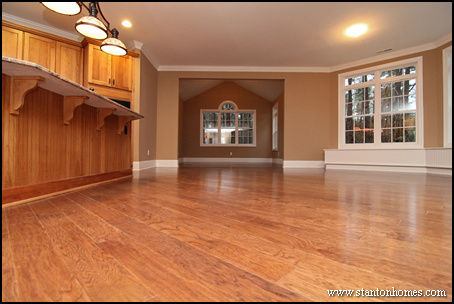 Hardwood flooring can have a high-gloss, semi-gloss, satin, or matte finish. These options are similar to those you can find in wall paint colors. A low sheen or satin finish is one of the most popular selections for hardwood floors in Raleigh new homes. When selecting the type of hardwood flooring for your home, you can choose the plank width and height. The height will affect the longevity of your floors - determining the number of times you can sand and refinish your floors. The width will affect the style and feel of your floors. Generally, wider planks look less formal, but are more costly. The wood species - and choice of engineered versus solid wood - will determine aspects of your flooring's texture. There are many hardwood textures available including smooth, hand-scraped, distressed, and wirebrushed. See more hand-scraped hardwood flooring photos in a version of the Cannon, here. The design team at Stanton Homes can answer all your new home questions and give style, tone, and layout recommendations that meet your needs. One common question we are asked is: How many types of flooring can I include in an open floor plan - where all flooring transitions are visible? Is it possible to have tile in my kitchen, hardwood in my great room, and stone in my foyer, without creating a dizzying effect? 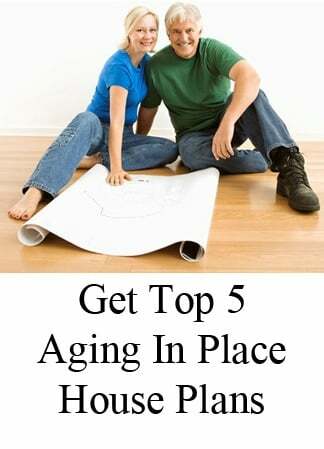 Below are our top 5 examples of how to transition from wood to tile, stone, or carpet. Can I use tile in my kitchen if it is completely open to a hardwood great room, or should I also use hardwood flooring in the kitchen? 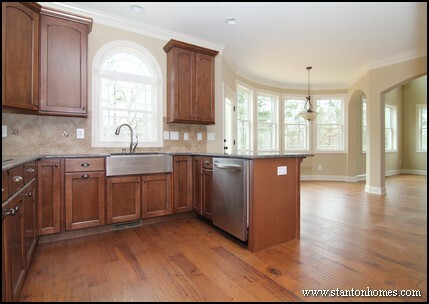 Even in very open floor plans, the great room and kitchen flooring styles do NOT need to match. In this example, taken from a version of the Dugan, the kitchen, breakfast room, and foyer are all tile, with a hardwood great room. As long as the flooring transitions align with other design elements (the walls and overlook in this case), they will not interrupt the flow of an open floor plan. In this second example, taken from a version of the Beaufort, the foyer and kitchen are both hardwood with a carpted living room in between. 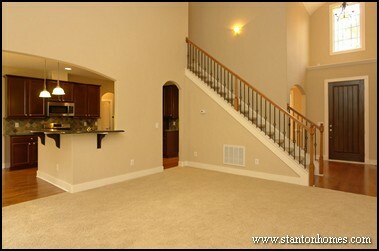 In this case, the staircase could use carpet or hardwood flooring. It is important to give each room of your home a distinct purpose, which is why we find the flooring transitions in this home pleasant. 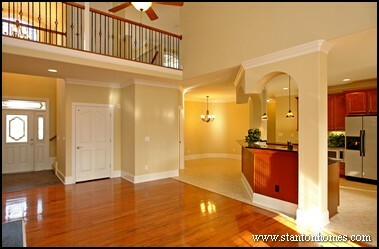 The transition helps portray the foyer, living room, and kitchen as individual rooms, not just open space. 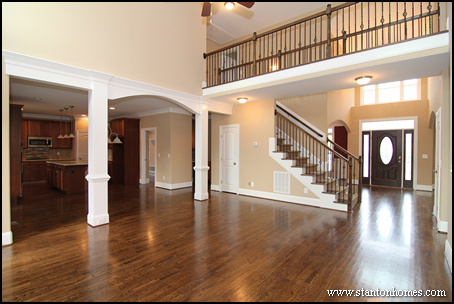 In this example (taken from a version of the Mastrosimone), the foyer, great room, dinning room, and staircase all use hardwood flooring. 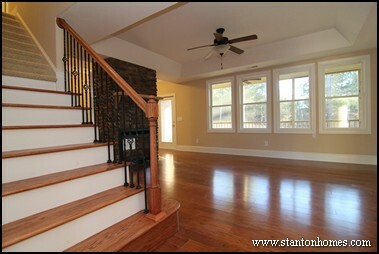 The second story, however, transitions into carpet with one final "step" of hardwood. 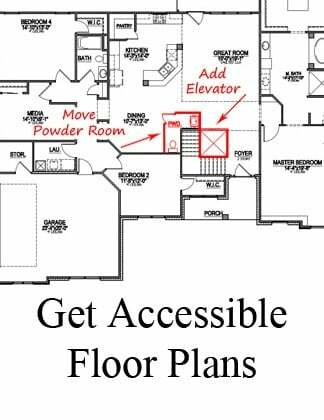 Becuase the carpet is not visible from the first floor, this is a great way to save money on flooring costs, while keeping the first floor completely upscale. Can I transition from from hardwood to carpet in the MIDDLE of a staircase? 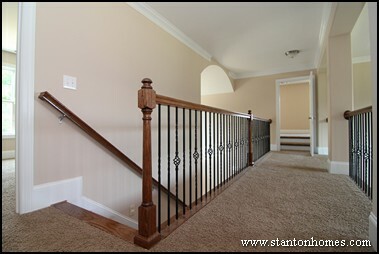 In this version of the Firebird, hardwood is used for all steps with open wrought-iron railing. From the foyer and living room, only hardwood is visible. The homeowner desired a clear transition from the "formal living areas" to a softer feel for the upper bedrooms. 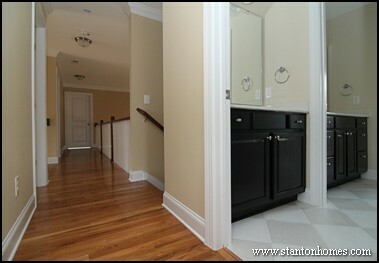 Including hardwood on just the exposed treads can also save some cost. Whether you have carpeted or hardwood hallways, there is a nearly seemless transition into a bathroom, laundry, or mudroom. While full baths have either tile or vinyl flooring almost without exception, a Powder Room or Half Bath can be floored in hardwoods as well, if a consistent flooring is desired. 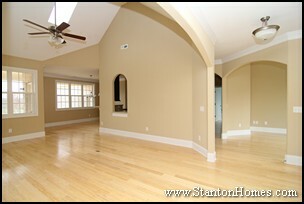 With Stanton Homes, you'll be able to ask the advice of our on-staff experts before you choose your flooring. 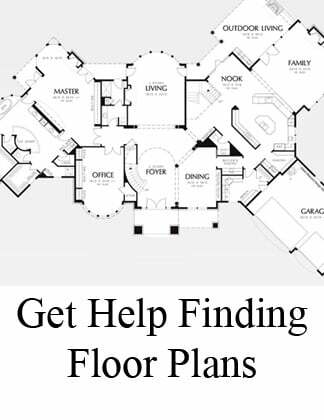 We'll help you decide what works best for your lifestyle and budget in your new custom home.